accommodation for up to 10 guests! Breathtaking and exquisite, luxury and premier. 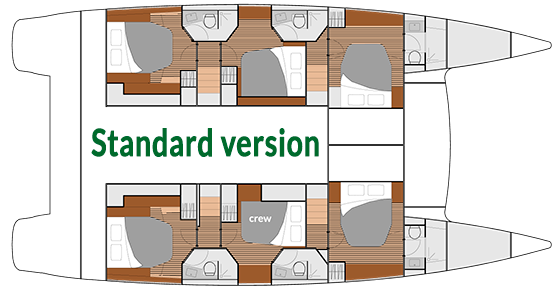 Our unrivaled Flagship Class TW7 is the catamaran you choose when only the very best will do! We've partnered with world-renowned boat designers and builders, Fountaine Pajot to build the TW7, a custom version of the original Catamaran Alegria 67. Spacious accommodation for up to 10 guests and offering the ultimate in stylish and luxury design, coupled with speed and high performance, this truly is a First Class experience on the seas. With a crew of three to pamper you and your guests, you'll definitely experience All-Inclusive luxury and decadence like never before. View the blueprints of the TW7 below. tank capacities fresh water: 1000 l / 278 gal. fuel: 1200 l / 291 gal. Proudly sailing with the CYBA Going Green Award. Fall in love with luxury, style and sophistication like never before as you wave goodbye to the shore aboard the TW7 - and enjoy a truly remarkable and unrivaled catamaran experience, starting with a Champagne Welcome from your crew! As soon as you step aboard this fabulous yacht, you will be living a lifestyle of the rich and famous. Be the envy of those around you and rule the seas onboard the TW7, a yacht that has style, comfort, performance and a stunning range of 'must-have features' in abundance. Designed in partnership with world-renowned Fountaine-Pajot, boat builders since 1976, and using our combined extensive knowledge and experience, we have created the finest luxury, spacious, and high performing yachts the market has to offer. You're guaranteed to enjoy exceptional first-class cruising and the ultimate in relaxation whilst underway with your guests. An idyllic combination of both comfort and style, the TW7 creates a perfect balance that makes it one of the most outstanding catamarans available on the yacht ownership market. Designed for its first-class cruising and furnished for luxury, style and comfort beyond compare, this yacht is at the cutting edge of sophistication. 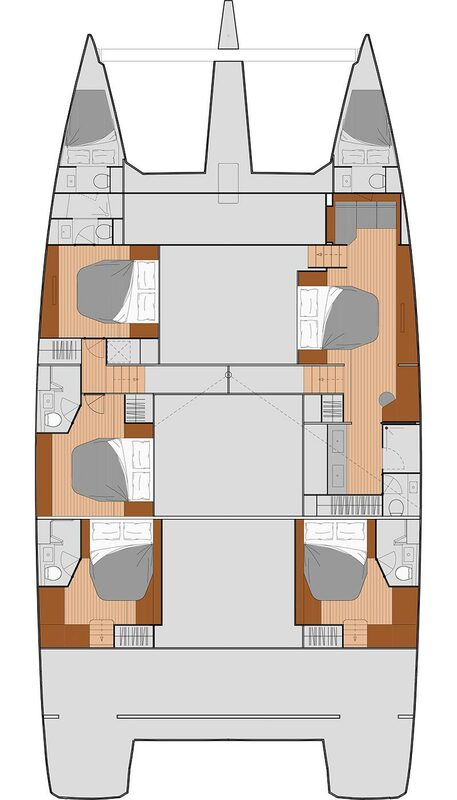 An exceptionally large flybridge, second to none is coupled with a spacious cockpit and saloon, making it ideal for both entertaining and relaxing. With a professional crew of three to look after your every need, you and your guests can enjoy a luxury, All-Inclusive five-star experience, including gourmet delights and fine wines, whilst your Captain takes you on a journey of discovery. Stunning contemporary interiors welcome you into the beautiful saloon area, where you'll find the central stairwells that lead to the individual, luxury private cabins, each furnished an ensuite bathroom and shower. A healthy breakfast accompanied by your guests up on the flybridge opens up a lively debate of the day’s plans and soon you're ready and raring to go. A quick dip in the mesmerizing turquoise waters before your Captain takes to the helm. What's on the cards for today? That's up to you and your guests! 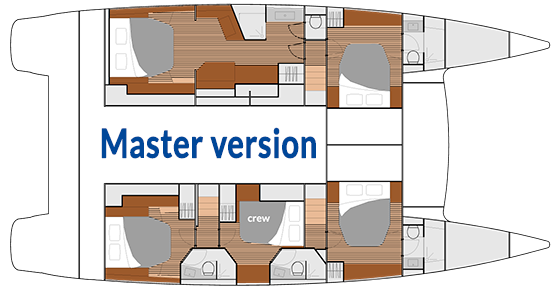 The Master TW7 has five cabins; one of which is an expansive Premium Stateroom with king-size bed. 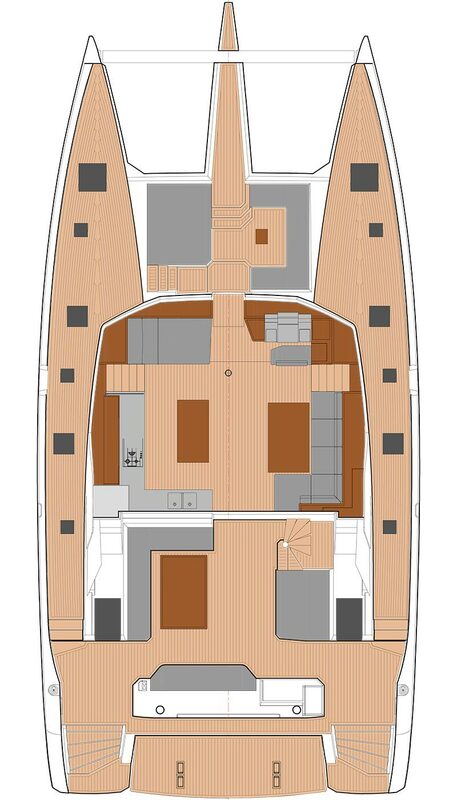 The Premium Stateroom and four of the luxury cabins are for guests, and the yacht is equipped with two crew cabins. Are you ready to take the plunge and own a TW7? Owning your own yacht will open a world of endless possibilities. Create a lifetime of unforgettable memories with your family and friends and live a life that others will envy. Let TradeWinds help turn your dreams of yacht ownership into reality. Owning a yacht with TradeWinds really is as easy as 1, 2, 3 – just leave the hard work to us. Are you ready for your next adventure? For us to help you make the best investment choice please answer these simple questions below. Yacht pricing does vary depending on model and currency. Fill in your details to obtain a free quotation. We will reply (usually within 24 hours) or call if you would prefer. Anything you want to know specifically? Please state where you heard about us? There is no obligation to you from this and you are able to change any of the options you choose when talking with us.